The Cavaliers, Cadets and Madison Scouts all notched wins over the weekend. 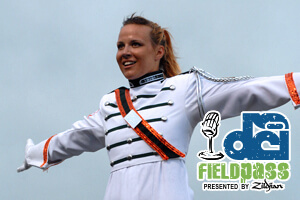 Dan Potter recaps the action and finds out what the drum majors of tomorrow think of the drum majors of Marching Music's Major League in today's Field Pass presented by Zildjian. Download and listen. (MP3, 10:31, 10.3 MB) Have a Field Pass question, comment or request? Leave a message for Dan Potter by phone at 317.275.1212 x40 or by e-mail at fieldpass@dci.org. Subscribe to this podcast through iTunes. Become a fan of the Field Pass on Facebook. Visit Zildjian.com. Field Pass archive. Photo by Jolesch Photography.